If you're local or ever in Asheville, please stop by our office to make your purchase in person! We are open 9:30-4:30, Monday-Thursday, EST. Go on 19/23 South (future I-26 East) toward Asheville. Get in the right hand lane once on Biltmore Ave. for 1.0 mile. 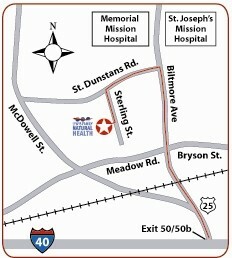 After passing the hospitals, take a right onto St. Dunstans Road (at the Beverly Condominiums). There is no traffic light at this intersection. Take your first left onto Sterling Street. LFNH is the second house on the right. Parking is located behind the building; there is also handicapped parking in the front. Turn left at the light at the end of the ramp onto Hendersonville Road. At the end of the ramp you will turn right onto Hendersonville Road. Move to the right-hand lane, and continue straight on Hendersonville Road (which will become Biltmore Avenue) for 1.2 miles. At the second light, you will see 2 lanes of traffic veering left toward the Biltmore Estate. Do NOT follow those lanes, but stay in the right lane going straight. You will cross railroad tracks, and then at the Wendy's, the road will start to curve and go up hill. At this point start to look for Lenny's Sub shop on your left. St. Dunstans Road is the next street on the left at the Beverly Condominiums. Turn left onto St. Dunstans Road. There is no traffic light at this intersection. Take your first left onto Sterling Street. LFNH is in the second building on the right.